The Precision Design UVS Universal Smartphone Stabilizer Mount is designed to fit most smartphones, allowing you to take sharper pictures and record steadier video. The large hand grip provides a sturdy shooting platform, features a Bluetooth shutter / record button, plus a bubble level and 2 tripod sockets. The phone is held in place with a spring-loaded clamp, and a 37mm diameter auxiliary lens can be positioned easily using two adjustment knobs. Compatible with both iPhone and Android. 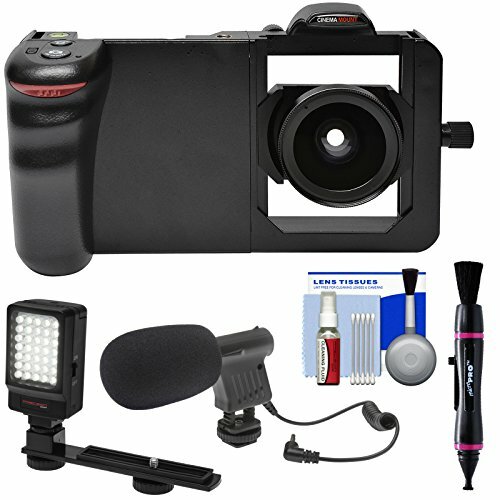 Includes grip, wide-angle auxiliary lens, phone lens adapter, lens pouch and neck strap. Record crystal-clear sound with the Vidpro Mini Condenser Microphone. This mic is great for use with most camcorders that utilize a 3.5mm jack, and it conveniently connects to any camera with the included mounting bracket. The Vidpro 3.5mm Microphone Adapter (Stereo TRS to Smartphone TRRS) is designed to let you connect a microphone with a 3.5mm output to smart devices with a 3.5mm TRRS input. Compatible with stereo microphones, and combines left and right channels to a mono signal for full compatibility with mobile devices. The Precision Design Digital LED Video Light is the perfect addition to your camcorder or digital camera when shooting in dark or shadowy areas. This unit has a powerful array of 35 bright LED bulbs that can extend a glow up to 25 feet.